I was watching the Tivo'd season finales of Desperate Housewives and Grey's Anatomy when I finished the back of Gracie. 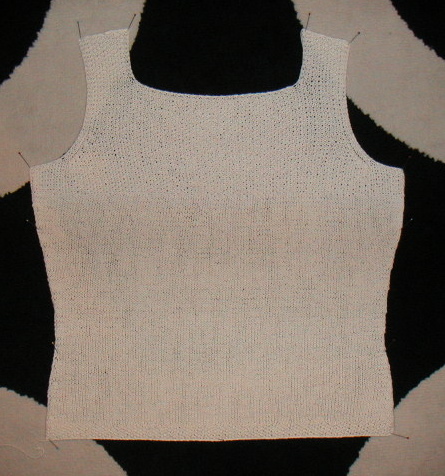 You can't really see it in the photo, but the hem and top third of the tank are done in moss stitch. I haven't cast on yet for the two front pieces, but I am thinking that I will do them at the same time. I also got the yarn I ordered from KnitPicks: Shine in violet for another tank and some Wool of the Andes to do some experimental knitting.